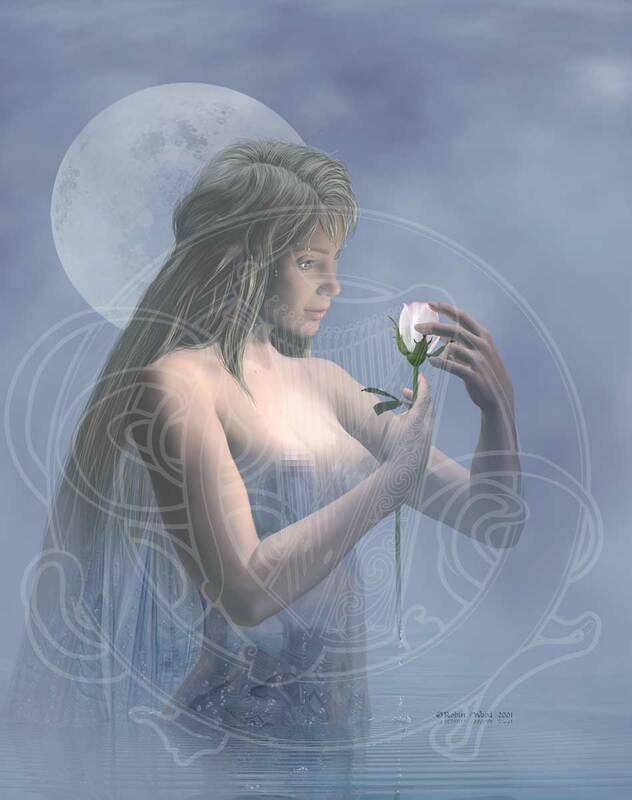 A Naiad transforming from pure water into flesh, gazing into a glowing rose. The image is one I saw in a dream, and worked on for some time. Several people have asked me what it means. Ummm. It means I have interesting dreams? (grin) If it means something to you, then, like all the other images I have made over the years, run with that meaning. That is what the art is really for, after all. The figure has been censored, in the image, because it's a family site. But she is naked, and her chest is beginning to turn into flesh, so you can see a hint of what you'd expect to be there, in the print. Just so you know before you buy it. The figure is Daz Victoria, the rose is one I made, and had on this site for a while, (in fact, I made it for this picture,) and her hair is also mine. I drew all the maps and things in Adobe® Photoshop®, assembled the piece in Bryce™ 4, and retouched it in Photoshop 5.